My Baby Wolf came with Texsolve heddles when I bought it used in 2005. 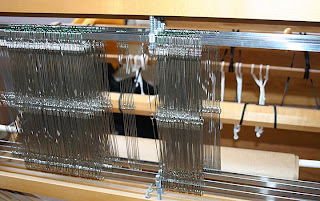 They've been ok but aren't the most fun to move around when warping the loom; push the top, push the bottom, repeat (and repeat) across the bar. With metal heddles, you give them a flick and they move out of your way. 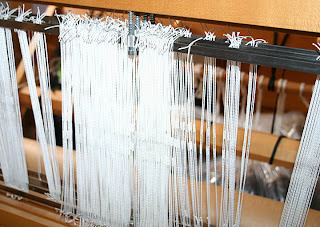 Texsolve heddles weigh less than metal, which was also a consideration since I use this loom for workshops. 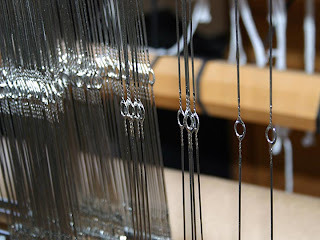 Over two years ago I bought big-eye metal heddles specifically to put on Baby but never got around to it. 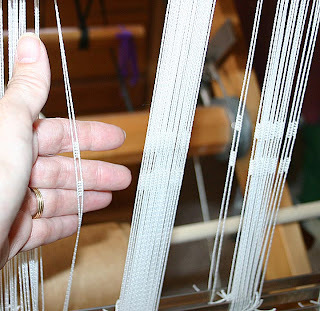 It's a fairly big job for a newish weaver and I admit I was a bit intimidated. But last night I decided it was time. It took a few hours but look what I've got - so pretty and so easy to use. Wish I'd done this years ago. 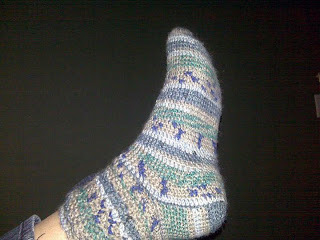 Guess who may get a second pair of hand-crocheted socks? Rachel texted me this photo tonight. Love seeing crocheted socks in the wild.